1. The Happy Kinder Parties Booking Fee is non-refundable unless Happy Kinder Parties cancel the booking. 2. Cancellation of an entertainer booking must occur at least 14 days prior to the party date otherwise the full party fee will be required. 3. The client agrees that there is a travel charge applicable to some areas. The client has asked Happy Kinder Parties for a travel quote or checked the website to find the amount of travel applicable to the party venue postcode, and added the correct amount to their booking from the drop-down list supplied. The client agrees that if they fail to do this, Happy Kinder Parties will add the correct amount of travel charge to the clients booking which will be payable by the client on the day of the booking to the entertainer. 4. There must be a parking space provided for the entertainer within maximum 5 minutes walking distance to the venue. The client understands that if there is not a parking space maximum 5 minutes walking distance provided, and Happy Kinder Parties have not been notified of this, that the extra time to unload equipment and set up may result in a delay to the performance start time. 5. The client must cover any parking charges if applicable. 6. The client must cover congestion charge charges if applicable. 7. The client has enquired with Happy Kinder Parties and has received email confirmation that there is availability on the required booking date. The client must then make the booking online with Happy Kinder Parties within 24 hours of receiving the email confirmation of availability, otherwise availability cannot be guaranteed. The client understands that failure to do so may result in Happy Kinder Parties cancelling the booking if a suitable entertainer is not available. 8. All “Party Extras” (to be found on the “Party Extras page” and for the interest of clarity anything additional to a party entertainer) must be paid in full in advance of the party. 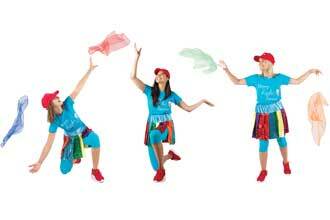 Once the payment is received from the client, Happy Kinder Parties will arrange and book the party extras. This means that all party extras are non-refundable and non-transferable. 9. There must be at least 2 adults present during entertainment and the safety of the children lies with the responsibility of the adults present not the entertainer booked. Happy Kinder Parties accepts no responsibility for any incidents that may occur at your event. Your entertainer cannot be held responsible for any injury arising from the games and activities included in the party. 10. Our themed parties are a tribute to the original and for trademark & copyright purposes we do not offer the original characters. 11. Princess entertainers are not booked as “lookalikes” they are booked as entertainers acting as a particular princess. Our princess dresses are designed to be able to run an active party in. Although every effort is made to book a princess with the correct colour hair, depending on the location of the party and the entertainer available wigs may be used. 12. 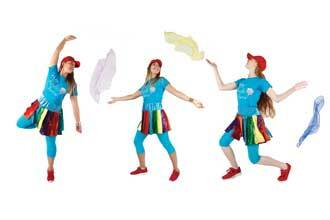 The Happy Kinder Parties website displays a selection of costumes available. The costume that is supplied may differ from what is shown as we have duplicate costumes of the same character. 13. If you would like a particular costume for your party/event, please look on our gallery page and write in the exact name of the costume on the “Entertainer costume” section on the booking page. We have duplicates of many of the characters so please be specific if you prefer one style over another. If there is no costume specified, we will select an appropriate costume for your party. We require at least 14 days’ notice for change of costume requirement. Please note, it may not be the entertainer shown in the costume photo that is your entertainer for your party/event. If you require a particular entertainer, please put their name in “Special requests” on the booking page. 14. Costumes unfortunately do occasionally get lost in the post. We use recorded delivery to limit this happening, however it is still a possibility. In this circumstance, we will do our best to replace the costume requested with a suitable one that fits the party theme. If this is not possible due to limited postage days, we will give you a list of the costumes your entertainer has for you to choose from. 15. Entertainers that have been specifically requested are subject to change at any point whereby a replacement entertainer of the same standard will be provided. Happy Kinder Parties reserve the right to make changes at short notice. 16. All Happy Kinder Parties Entertainers follow a similar party format. However, costumes, music, prizes, sound systems, props and equipment may vary between entertainers. 17. All our entertainers have a different style to how they entertain at a party/event, so if you like the sound of any particular activity from the website please put it in the “Special requests” section on the booking page so we can make sure it is included. Balloons, glitter tattoos, parachute, music, games, competitions, magic are all included as standard unless not required. 18. Our entertainers use only quality face paints (Snazaroo and Grimas) which are suitable for sensitive skin. Happy Kinder Parties accepts no responsibility for any guests who have make-up, face painting or any cosmetic allergies. Please check with all your guests before the party begins and inform the entertainer of any allergies. 19. Happy Kinder Parties shall not be liable to the client or be deemed to be in breach of the contract if there is delay in performing, failure to perform, illness or injury of the entertainer or if the delay or failure is due to any cause beyond Happy Kinder Parties reasonable control, including illness, accident, breakdown, fire, flood, storm or poor weather. Happy Kinder Parties does not offer compensation of any form. Happy Kinder Parties will do their upmost to supply an alternative entertainer for your party and failing to do so we will refund the booking fee. 20. If the client needs to change the date of the party due to severe weather or illness as a good will gesture the client may postpone a booked party to another date within 4 weeks of the original booking date if Happy Kinder Parties have availability. Available dates will be offered at the discretion of Happy Kinder Parties and may result in a mid-week slot being offered if the weekends are fully booked. If a postponed date within 4 weeks cannot be agreed by the client then the full party fee will still be payable as per term 2 above. 21. Happy Kinder Parties accepts no responsibility for any loss or damages at your party venue. 23. If the party costume is not confirmed at least 14 days prior to the party date, it will automatically become our “Happy Kinder Party” costume. 24. If Arts and Crafts activities are booked but not confirmed at least 14 days prior to the party date they will be chosen by Happy Kinder Parties. One Arts and Crafts activity will be supplied per 30 minutes. 25. If a party theme is requested that is not displayed on the website and we do not have the music within our library the client must supply the requested music for the entertainer to use. 26. Your entertainer can withdraw activities if they feel the venue space, flooring or number of children make the activity unsafe. 27. If other entertainment is booked for the children or there are other distractions, e.g. bouncy castles, soft play, toys, uncovered food, Happy Kinder Parties advise for them to be removed while the party entertainment is running. If not the client understands that children may be distracted by the other items and therefore not be with the entertainer. 28. You must notify your entertainer of any disabilities, allergies, phobias or injuries the children may have. 29. Once a booking has been made and confirmed, any changes to the booking information will incur a £15 administration charge. 30. By paying the Booking Fee to secure the booking you are agreeing to the terms and conditions above. Please note that by paying the deposit you have agreed to these terms and conditions. 1. The promoter is: Happy Kinder Parties Ltd (company no. 8014577). 2. The competition is open to residents of the United Kingdom aged 18 years or over except employees of Happy Kinder Parties and their close relatives and anyone otherwise connected with the organisation or judging of the competition. 6. Closing date for entry will be 30th September 2018. After this date the no further entries to the competition will be permitted. 7. No responsibility can be accepted for entries not received for whatever reason. D) The more comments with two tags you enter, the more chances to win you have! prize must be used within 12 months of the competition closing. 12. The prize is as stated and no cash or other alternatives will be offered.The prizes are not transferable. Prizes are subject to availability and we reserve the right to substitute any prize with another of equivalent value without giving notice. 15. The promoter’s decision in respect of all matters to do with the competition will be final and no correspondence will be entered into. 17. The competition and these terms and conditions will be governed by [English] law and any disputes will be subject to the exclusive jurisdiction of the courts of [England]. 18. The winner agrees to the use of his/her name and image in any publicity material, as well as their entry. Any personal data relating to the winner or any other entrants will be used solely in accordance with current [UK] data protection legislation and will not be disclosed to a third party without the entrant’s prior consent. 20. This promotion is in no way sponsored, endorsed or administered by, or associated with, Facebook, Twitter or any other Social Network. You are providing your information to Happy Kinder Parties and not to any other party.